The boy had carried dead and sick bird from a cage for food preparation before he became ill.
A NINE-YEAR-old boy has died from bird flu in Cambodia, the 10th victim this year, the World Health Organisation said today, warning that the kingdom’s deadliest outbreak of the virus could continue. The boy, from the northwestern province of Battambang, died in a children’s hospital in the nearby tourist hub of Siem Reap last night after falling ill last month, the WHO in Cambodia said in a statement. “The boy carried dead and sick ducks and chickens from a cage for food preparation by his sister before he became sick,” said spokesman Sonny Krishnan. Tests confirmed the victim had contracted the H5N1 strain of avian influenza, he added. 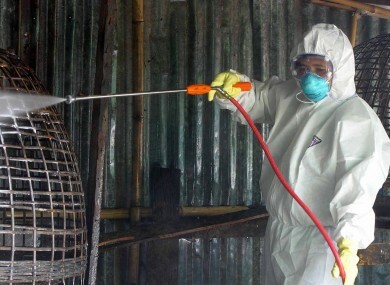 Cambodia is seeing its deadliest outbreak of the virus, topping the eight killed in 2011. “We at WHO are concerned. The H5N1 virus is still circulating in the country,” Krishnan told AFP. “One probable reason for its spread is through the unregulated, informal, movement of poultry from village-to-village by poultry transporters on motorbikes,” he added. Cambodia has recorded 37 human cases of H5N1 since 2003, with all but eight of them proving fatal. Authorities have been scrambling to control the outbreak, although scientists have been baffled by the sharp rise in deaths this year. The virus has killed 378 people worldwide since a major outbreak in 2003, according to WHO statistics. It typically spreads from birds to humans through direct contact. But experts fear it could mutate into a form easily transmissible between humans, with the potential to trigger a pandemic. Another strain of bird flu, H7N9, has killed at least 45 people in China, out of some 134 confirmed cases in the country. Scientists in China recently reported the first likely case of person-to-person transmission of the virus, but urged people not to panic saying the virus’s transmissibility remained “limited and non-sustainable”. Email “9-year-old boy dies from bird flu in Cambodia”. Feedback on “9-year-old boy dies from bird flu in Cambodia”.